"Audience enters into the brand new underground Henry Miller Theater, soon to-be-christened the STEPHEN SONDHEIM THEATER. It is under-attended, more modern than you're comfortable with, and requires you to travel deeper down than you think you ought to. Good job with the naming, Roundabout." Stephen Sondheim (born March 22, 1930 in New York City) is one of the 20th Century's most respected composers of musicals. He's won seven Tony Awards, an Academy Award, several Grammy Awards, and the Pulitzer Prize. He began on Broadway as a lyricist, and then began writing his own music. Critics of his work complain that the songs are too complex and unhummable, which he went on to lampshade in such works as Merrily We Roll Along and Sunday in the Park with George. The Last of Sheila (1973) — not a stage musical; not a musical at all in fact. It's a 1973 theatrical feature film that he co-wrote the screenplay for. Sondheim's only screen writing credit. In 2008 Bounce was re-worked, with some songs removed and others added, one character entirely cut, and the plot rewritten; the resulting piece is now called Road Show and it opened off-Broadway in November 2008, directed by John Doyle. 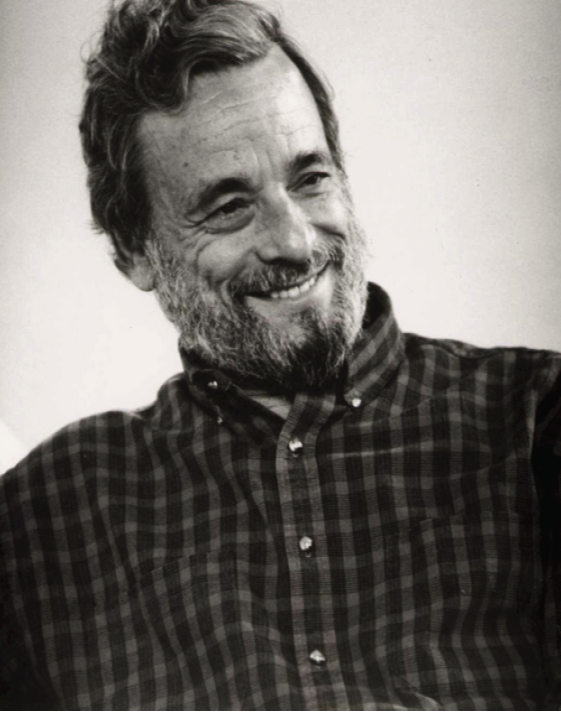 Sondheim has also done the movie scores for two films: Warren Beatty's Reds and Alain Resnais' Stavisky. His collected lyrics (with his comments and recollections) have been published in two volumes: Finishing the Hat and Look, I Made a Hat. Added Alliterative Appeal: Any Sondheim musical will include this, with lines like "I feel fizzy and funny and fine," "The realities remain remote," "The bong of the bell of the buoy in the bay," and the infamous "That's the puddle where the poodle did the piddle." All Musicals Are Adaptations: He's perhaps the only man ever to adapt a painting into a full-length musical. He's only done one completely original show: Anyone Can Whistle. Breaking the Fourth Wall: Almost always Played for Laughs. Used to great effect in plays like Sweeney Todd: The Demon Barber of Fleet Street, The Frogs, Company and especially in the second act of Into the Woods. Counterpoint Duet: BIG fan of this, puts it in almost all his shows, and sometimes going one step further and making it into a trio, quartet, quintet, sextet, septet, or an ensemble number with as much as 8-part counterpoint!! Downer Ending: Assassins, West Side Story (inherent in the source material), Merrily We Roll Along (subverted in that it's placed at the beginning), Sweeney Todd, Follies, Evening Primrose. Some stagings of Gypsy, notably the 2008 production starring Patti LuPone. Gossipy Hens: Most of the minor characters in Sunday in the Park with George, and some Gossipy Roosters in the form of the soldiers in Passion. Patter Song: Uses these often in his musicals, such as "Getting Married Today" in Company, "The Contest" in Sweeney Todd, and "Now" in A Little Night Music. Reconstruction: Arguably, Passion, of the archetypal love epic. Sanity Slippage Song: He's got several - "Epiphany" from Sweeney Todd, "Getting Married Today" from Company, "Live, Laugh, Love" from Follies, "Franklin Shepard Inc." from Merrily We Roll Along, and "Rose's Turn" from Gypsy. And really, any song containing the word "Ballad" in Assassins. Subverted Rhyme Every Occasion: More often inverted than played straight. Often he'll complete the rhyme, but in a way you'd never guess. Or he'll stuff in a bunch of internal rhymes where no other songwriter will dare. Camp Gay: In "The Boy From...", the narrator describes the young man she has a crush on, completely oblivious to the implications of his flamboyant dress sense and effeminate mannerisms. Cut Song: The revue Marry Me A Little was made entirely from his Cut Songs. Never Speak Ill of the Dead: Inverted in his books of collected & annotated lyrics, where he writes frank and incisive commentary about other lyricists' work, but only ones already dead. In his own words: "speaking ill exclusively of the dead seems to me the gentlemanly thing to do. The subject cannot be personally hurt, and his reputation is unlikely to be affected by anything you say, whereas publicly passing judgement on living writers is both hurtful and stifling." No Song for the Wicked: Surprisingly, the villain in Evening Primrose (Ms. Munday) did not receive a song of her own, most likely because it was only written to fit within an hour of television broadcast time. Many fans think that if Evening Primrose were to be expanded for stage, Ms. Munday should deserve a song. Overly Long Name: In "The Boy From...", a parody of "The Girl From Ipanema", the young man in question hails from Tacarembo la Tumba del Fuego Santa Malipas Zacatecas la Junta del Sol y Cruz. And at the end of the song, he moves to Llanfair­pwllgwyngyll­gogery­chwyrndrobwll­llan­tysilio­gogo­goch. Sondheim joined forces with Andrew Lloyd Webber for "Hey Mr Producer", a tribute concert to Cameron Mackintosh. They performed a duet riffing on their songs "Send In The Clowns" and "Music of the Night", all while playfully ribbing Mackintosh. For the retrospective Sondheim on Sondheim, he wrote a new song: "God"